Our Amman workshop took place between 29 July - 2 August, 2018. 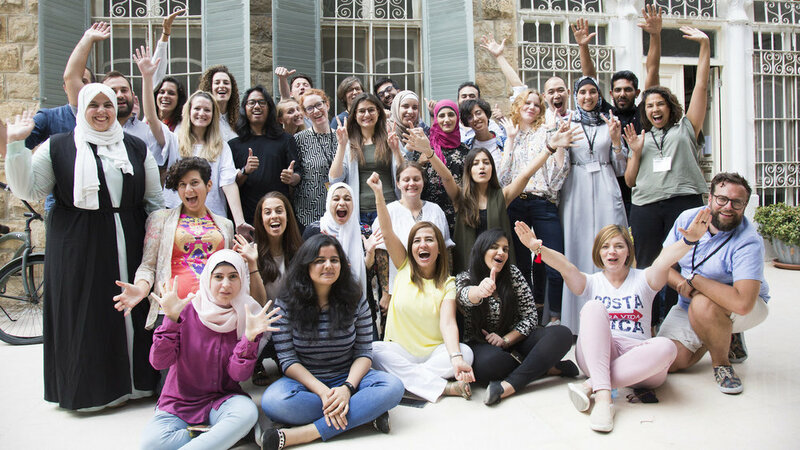 We were super excited to host our first-ever workshop in Jordan. It was hosted at Nofa, an old villa turned into a beautiful art gallery and community space on Rainbow Street in the centre of town. Nearly 200 people applied to take part in our seventh flagship event. In total, 31 talented people attended with participants coming from Jordan, Egypt, Lebanon, Tunisia, India, Costa Rica, Brazil, Indonesia, Sweden, Italy, UK and the US. Our mission was to support Jordanian CSOs, and from the 13 that applied to attend the workshop we selected four. They were Rasheed Transparency International Jordan (Rasheed TI-Jordan), Information and Research Center King Hussein Foundation (IRCKHF), Arab Women Organization (AWO) and Arab Reporters for Investigative Journalism (ARIJ). You can find out more about them and the projects we created together below. Our fabulous partner for this event was the Amman-based journalism and podcast organisation SOWT, which means ‘voice’ in Arabic. They have a longstanding track record of working on innovative and engaging journalism in Jordan and also knows every good place to eat in Amman, which meant that we were very well fed at this workshop (proof of this in the photo gallery of this event). Shukran! Keep an eye out for upcoming workshops if you're inspired to try your hand at becoming one of our alumni. Click on the screens to explore the projects below and get a taster for what we do at a DATA4CHANGE workshop. Coming soon! In the meantime, check out the galleries on our Facebook page.